The Karate Kid is back! It's only been a few months since the new YouTube Red series Cobra Kai was announced, which brings back stars Ralph Macchio (Daniel LaRusso) and William Zabka (Johnny Lawrence) from the original Karate Kid movie. 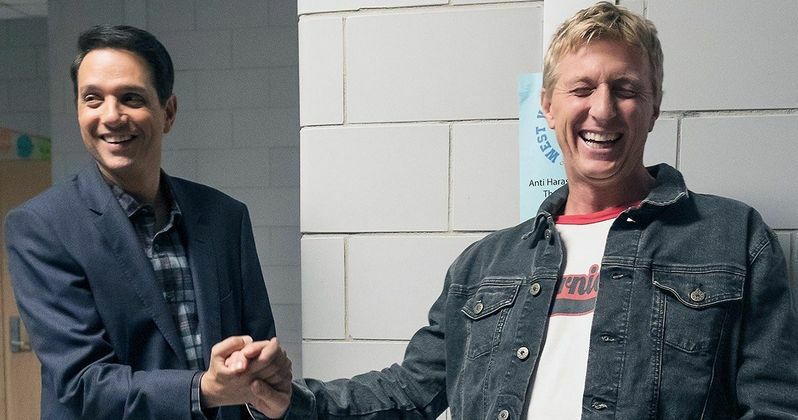 Production is already under way in Atlanta, with the first photo emerging, featuring both Ralph Macchio and William Zabka reuniting on set. This comes with the news that five more cast members have been announced. Joining Maccio and Zabka will be Xolo Mariduena, Mary Mouser, Tanner Buchanan and Courtney Henggeler, with Ed Asner joining as a guest star. The Karate Kid sequel series is set 30 years after the events of the 1984 All Valley Karate Tournament, following a down-and-out Johnny Lawrence (Zabka). He is described as a, "heavy drinking, short-fused antihero living in Reseda, doing odd jobs to make ends meet," who seeks redemption by reopening the infamous Cobra Kai karate dojo. This reignites his rivalry with a now successful Daniel LaRusso (Macchio), who owns the top-selling car dealership in the Valley, but has been struggling to maintain balance in his life without the guidance of his mentor, Mr. Miyagi. The show is about two men addressing past demons and present frustrations the only way they know how: through karate. Courtney Henggeler has come aboard to play Amanda, Daniel LaRusso's wife and business partner, who is described as, "the glue that keeps the LaRusso household and dealership running" and a calming force in Daniel's life. Mary Mouser is playing Daniel and Amanda's "firecracker daughter" Samantha who is walking the line between the good girl and popular teen cliques. Xolo Mariduena is playing Miguel Diaz, who is being bullied by the kids at his new school while being raised by a single mother from Ecuador. That all changes when he's taken under the wing of his Cobra Kai master Johnny Lawrence. Tanner Buchanan is playing Johnny Lawrence's son Robby Keene, who wants to prove to everyone that he's nothing like his father, even though he's heading down the same path. The final new cast member is Ed Asner, who will guest star as Sid Weinberg, Johnny's stepfather, described as, "an old-school, hard-nosed, former studio mogul, who is tired of dealing with his stepson's failures." Cobra Kai is written and executive produced by Josh Heald (Hot Tub Time Machine), Jon Hurwitz and Hayden Schlossberg (Harold & Kumar film series). Together, the trio conceived of this new Karate Kid storyline that picks-up decades after the original film ends. Hurwitz & Schlossberg will direct much of the series. James Lassiter and Caleeb Pinkett will executive produce for Overbrook Entertainment in association with Sony Pictures Television Studios. The 10-episode, half-hour series, coming to YouTube Red in 2018, reimagines one of Hollywood's most popular tales of rivalry and redemption. With over $619 million at the worldwide box office, The Karate Kid franchise has entertained millions of fans for over 3 generations. For years, YouTube fans from around the world have also kept the legend of the films alive through uploads of clips, tributes and related content, amassing over 1 billion views to date. Take a look at this first set photo from Cobra Kai, courtesy of Entertainment Weekly, as production continues.